Some cars just fit right for a road trip. 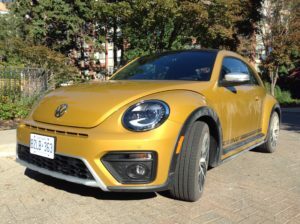 That’s what I realized on a late summer Toronto-Kingston-Rideau Canal jaunt in the 2016 Volkswagen Beetle Dune. The Dune, wearing dust from Wolfe Island near Kingston, Ontario. No matter where I drove, admiring gazes followed the car. Several times, I stood some distance away after parking the Bug to see how passersby reacted. Sure enough, people slowed down to get a better look. Younger pedestrians in particular outright stopped to admire the car all around. The Beetle was already one of the indisputably recognizable icons of the road. To create the Dune, VW gave it touches like a copper paint job, rear spoiler and the word “Dune” on the doors. Pronounced black wheelarch extensions flow into the bumpers, and at the back, a rear diffuser that also acts as a skid plate finishes off the look. A little extra mass makes s subtle difference. The Dune is 14 mm wider than other Bugs and the chassis sits 10 mm higher off the ground. 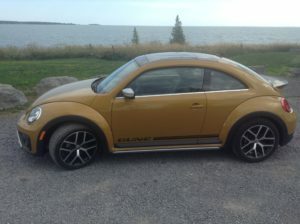 Polished aluminum sills and black trim strips are subtly reminiscent of the original Beetle running boards. The bugeye headlights still peep curiously out at the world, although bi-xenon headlights and LED daytime running lights now do the peeping. If you like the body colour, there’s more of it inside this Bug. Stitching and piping on the manually adjustable seats draws the eye right away. Yellow graphics on instrument cluster gauges also match. The most obvious colour matching happens on the metal accents of the doors and dash. There’s plenty of room for my 6’5” in the front seat. No matter how far forward I moved the front seat, I couldn’t bring myself to squeeze into the back. One average-height passenger said she was comfortable behind another average-height passenger on a 2-hour trip out of town, so it looks like this people hauler will keep passengers as happy as the driver. The leather-wrapped wheel and shift knob and the panoramic sunroof are the only luxury touches in what is otherwise a functional interior. Kudos to VW for putting a flat botton on this Dune-branded wheel. Climate controls were refreshingly analogue – three dials and a few buttons led to adequate cooling. Two of those buttons were for seat heaters. Removable rubber “mats” sit at the bottom of storage cubbies. Taking those mats out to clean them couldn’t be simpler. The light and windshield wiper controls both offer automatic settings, so the headlights turn on when it’s dark and the windshield wipers start up when it rains (or there’s a little too much bug splat hitting the windshield). I spent my week with the Dune on the road, so my hockey bag never entered the hatch. That said, the bag likely would have fit without the privacy cover having to come out. A large Fender speaker took up about 4 inches of cargo space on the right side of the hatch, but it likely won’t present many problems in everyday use. The underside of the privacy cover features a handy hook. A 6.3-inch Composition Media infotainment system with capacitive touch sensor sits at the top of the centre stack. The navigation system worked well, when it could find the places I wanted to go. Entering destinations is easy and quick using the responsive screen. In at least one case, giving it an extra ten seconds allowed it to display the destination I wanted in its list. But I found the POI database lacking. It couldn’t find each provincial park I visited, for instance. Also, its knowledge of small-town Ontario proved sketchy. Getting more destinations ought to be as easy as swapping the SD card in the system for one offering greater detail. Satellite radio usually kept me company when I wasn’t streaming an audiobook from my iPod. All audio came through a premium 8-speaker Fender audio system (plus the subwoofer in the hatch). The instrument cluster contains one digital screen at the bottom of the speedometer. Buttons on the right side of the steering wheel let drivers scroll through various information and settings screens. A tach sits to the left of the speedo and a fuel gauge of the same size to the right. Here’s a truly Teutonic touch: the fuel gauge is split into 32 sections. iApp-Connect enables integration with Apple CarPlay Android Auto and MirrorLink. Connectivity options include BlueTooth and two SD card slots to either side of the touchscreen, one of which held the navigation system card. While I appreciate VW’s efforts to keep things simple (and economical), the Bug could offer more than one USB port. The 1.8L TSI engine offers a great balance of highway passing power and overall fuel economy, thanks to its 170 horsepower and 184 pound-feet of torque. There’s an off-road suspension on this Dune, which suggests that drivers could use it as a dune buggy, though I’d be leery of doing so. Ride comforts was great on both highways and city streets. The power and handling came in handy during a fun drive on the twisty Opinicon Road, about half an hour north of Kingston on my way to Chaffey’s Lock on the Rideau Canal. The 5-speed manual transmission would have been fun here, though the 6-speed automatic handled itself well in most circumstances. On quieter rides, like the scenic Highway 33 between Kingston and the Glenora Ferry to Prince Edward County, the whole package faded into the background, letting me enjoy the sights. The gearbox could use a little tuning. I hit traffic on uphill portions of highways where I had to slow down a little. I was disappointed that the Bug didn’t shift down and rev up to provide more power, choosing instead to grumble on while the needle on the tach fell close to 1,000 rpm. Otherwise, the gearbox did its job unobtrusively. VW publishes mileage of 9.6 L/100km in the city and 7 L/100km on the highway, with numbers for the manual transmission being almost identical. Several times, on downhill slopes, the screen in the instrument cluster claimed consumption of 0 L/100 km, though it made up for that on uphill climbs. Active safety technology include blind spot detection, park assist and a rearview camera that pokes out of the VW logo on the rear hatch. That logo is a fun VW touch, since it also serves as the hatch opening handle. Press the “V” on the logo and it pivots so you can grab behind the “W” to pull it up and open the hatch. The 2016 Beetle Dune starts at $26,990 MSRP. The base-level Bug retails for $19,990. Whichever trim level you choose (there’s another one between these two), expect attention and plenty of fun on the road.